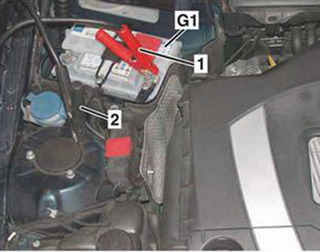 The battery (G1) is located at the rear of the engine compartment on the right under the cover. The battery cover must be removed without using tools. • Connect negative clip (2) of charger to body ground point. • Connect positive clip of jumper cable to positive terminal of jump-starting battery and positive clip (1) to positive terminal of front prefuse box (F32). 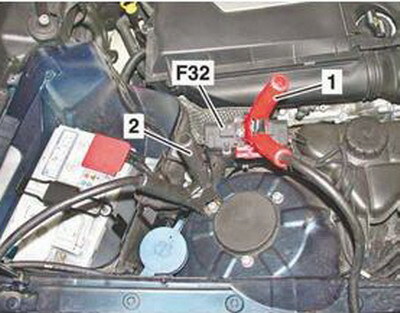 • Connect negative clip of jumper cable to negative terminal of jump-starting battery and negative clip (2) to ground terminal on righthand strut tower in engine compartment. • Disconnect ground line of battery (G1) and protect it against unintentional contact. • Disconnect positive line of battery (G1). 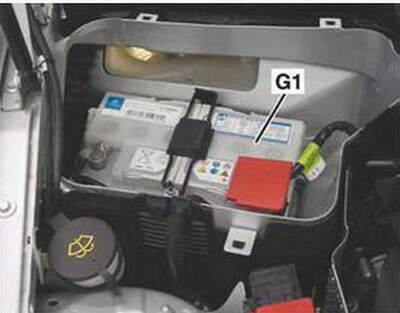 After the removal/installation of the battery (G1) basic programming (normalization) of the vehicle is required. 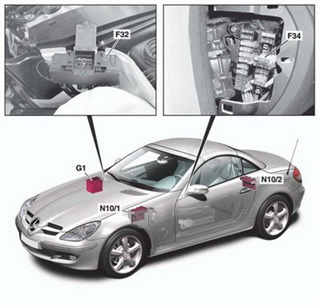 In this section we have some useful information about some Mercedes Benz 171 battery control unit and it features.